Genuine Efest 26650 4200mah 3.7V Flat Top rechargeable battery. Batteries can be extremely dangerous if used incorrectly. It is recommended that only insulated batteries are used in your devices. Do not use batteries that have been damaged or have no insulation and that don't have insulation around both terminals. If your battery wrap has a hole in it, loose change in your pocket, keys, or even with a ring on your finger, reaching into your pocket or purse, can complete the circuit causing a potentially dangerous situation. Using a battery case is advised. - Never leave your battery unattended while its charging. Lithium ion batteries are more likely to suffer from incidents while recharging than they are when in use. - Do not leave batteries on a charger after they are fully-charged. - Do not leave a battery charger plugged in. Unplug it after use. 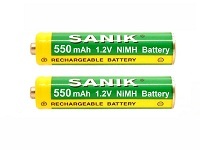 - If a battery comes off charge at 4.25v or higher, then the charger is faulty and must not be used.